≡ What is your Idea about role of FECO ? 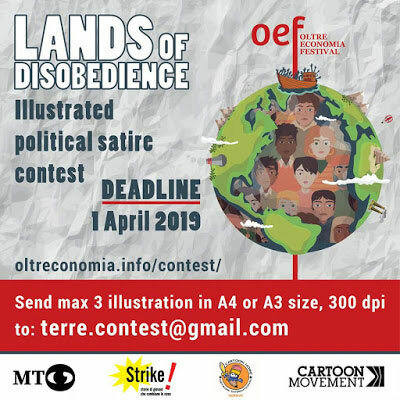 This political cartoon competition is organized by the Oltreconomia Festival of Trento together with the #MyTakeOn project of the political cartoonist Emanuele Del Rosso. Its theme is in line with the one of the sixth edition of the abovementioned festival, i.e. “Lands of Disobedience”. Lands – real or metaphorical – where civil disobedience takes place are everywhere. A positive and peaceful change has been achieved several times in history, and any of these experiences of civil activism taught us something. This competition asks cartoonists to tackle the theme of civil disobedience at large, so to give the public the chance to reflect on it in a fruitful way. The contest is also sponsored by the Dutch and the Norwegian cartoonists collectives Cartoon Movement and Cartoon Home International and by the Italian Association “Strike!”. 1 - The competition is organized internationally and it is open to all amateur or professional cartoonists. 2 - The Subject of the competition is "Lands of Disobedience". Under this title are topics like activism, peaceful protests, movements that oppose the status quo. Such lands can be real or imagined/metaphorical. 3 - As the competition is organized on an international scale, works without written text are most welcome. If a text is present, it must be accompanied by a caption in English. 4 - Any illustration technique is accepted. The size of the artwork should be at least A4 (29.7 cm x 21 cm), A3 (29.7 cm x 42 cm), 300 dpi, and JPG format. 5 - The works to be sent to the competition may have been published before but they should not have been awarded a prize in any competition. The award will be cancelled if the award-winning works are documented to have received a prize in another competition. 6 - It is possible to participate in the competition with maximum 3 works. Participants will not be given more than one award. 8 - The Deadline for the reception of the works is April 1, 2019. The illustrations submitted after this date will not be evaluated. 9 - The Oltreconomia Festival and #MyTakeOn project reserve themselves the possibility of using the received cartoons in various media and publications, newspaper and internet sites. All the participants, by sending works to the contest, acknowledge that they accept the conditions of the competition, and will not seek any future compensation in the event that the works they submit are used in the abovementioned ways. 10 - Members of the jury and members of the organizing committee cannot take part into the contest. 11 - The cartoons found appropriate by the jury might be exhibited at various events in different countries other than Italy. 12 - An exhibition will be held showing the first 30 cartoons. All rights reserved by «TabrizToons» and republish of the contents above are only permitted with a link to us included.